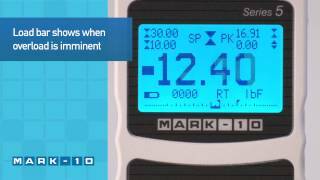 Get the most precise measurements when you need them with the Mark-10 Force Gauge Series 5. Advanced digital force gauges are designed for tension and compression force testing in various applications across virtually every industry. The Series 5 Force Gauges feature an industry-leading sampling rate of 7,000 Hz, producing accurate results even for quick-action tests. The gauge boasts an accuracy is 0.1% of full scale 1 digit, and its resolution is 1/5000. The backlit LCD displays graphics in large, easy-to-read characters, while the simple menu navigation allows for quick access to the gauge's features and customizable parameters. Data can be quickly transferred to a PC or other data collector via USB, RS-232, Mitutoyo (Digimatic), or analog outputs. Several models of the Mark-10 Force Gauge Series 5 are available. The capacity x resolution of each model is shown in the table below. Different voltages and power cords are available for Series 5 gauges: 110 VAC, 220 VAC with European plug, 220 VAC with UK plug, or 220 VAC with Australian plug. An optional USB to RS-232 serial cable is available, which allows you to connect to your computer for further data analysis.